Ramezani, P., Hejazi, S., Narimani, M., Soleimanifard, S. (2017). In vitro antileishmanial activity and apoptosis induction of Pleurotus ostreatus alcoholic extract on Leishmania major. 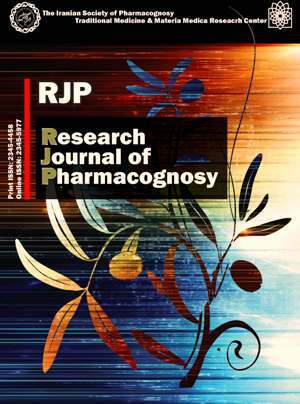 Research Journal of Pharmacognosy, 4(3), 51-58. P. Ramezani; S.H. Hejazi; M. Narimani; S. Soleimanifard. "In vitro antileishmanial activity and apoptosis induction of Pleurotus ostreatus alcoholic extract on Leishmania major". Research Journal of Pharmacognosy, 4, 3, 2017, 51-58. Ramezani, P., Hejazi, S., Narimani, M., Soleimanifard, S. (2017). 'In vitro antileishmanial activity and apoptosis induction of Pleurotus ostreatus alcoholic extract on Leishmania major', Research Journal of Pharmacognosy, 4(3), pp. 51-58. Ramezani, P., Hejazi, S., Narimani, M., Soleimanifard, S. In vitro antileishmanial activity and apoptosis induction of Pleurotus ostreatus alcoholic extract on Leishmania major. Research Journal of Pharmacognosy, 2017; 4(3): 51-58. 1Department of Parasitology and Mycology, School of Medicine, Isfahan University of Medical Sciences, Isfahan, Iran. 2Skin Disease and Leishmaniasis Research Center, Department of Parasitology and Mycology, School of Medicine, Isfahan University of Medical Sciences, Isfahan, Iran. Background and objectives: Leishmaniasis is caused by the genus Leishmania. Medications such as antimony compounds for the treatment of the disease are associated with limitations along with several side effects and disease recurrence; thus, evaluation of natural compounds with history of antimicrobial properties such as Pleurotus ostreatus, is of a great importance. The purpose of this study was to evaluate the apoptotic and leishmanicidal effects of Pleurotus ostreatus alcoholic extract on Leishmania major promastigote in vitro. Methods: Different concentrations of Pleurotus ostreatus extract (50, 100, 150, 200 and 250 μg/mL) were tested at 6, 24, 48 and 72 h on Leishmania major (MRHO/IR/75/ER) promastigotes. The leishmanicidal effects were determined using MTT [3-(4,5-dimethyl thiazolyl- 2)-2,5-diphenyle tetrazolium bromide] assay. Also, apoptosis induction was measured by flow cytometry and DNA fragmentation analysis. Results:The MTT results showed that leishmanicidal effect of Pleurotus ostreatus extract was dependent to extract concentration in a way that the lowest number of live promastigotes was obtained after treatment with 200 μg/mL of extract preparation at 72 h. The IC50 of Pleurotus ostreatus extract was 160±2 μg/mL. Flow cytometric analysis showed that the extract could induce apoptosis in promastigotes at its IC50. Also, the result of gel electrophoresis showed that DNA fragmentation of treated promastigotes at the same concentration. Conclusion: The results indicated that Pleurotus ostreatus alcoholic extract have a strong toxic effect on cultivated Leishmania parasites. Based on these results in vivo studies using rodent models and human cutaneous leishmaniasis CL is recommended. Sharma U, Singh S. Immunobiology of leishmaniasis. Indian J Exp Biol. 2009; 47(6): 412-423. Abdolmajid F, Ghodratollah SS, Hushang R, Mojtaba MB, Ali MM, Abdolghayoum M. Identification of Leishmania species by kinetoplast DNA-polymerase chain reaction for the first time in Khaf district, Khorasan-e-Razavi province, Iran. Trop Parasitol. 2015; 5(1): 50-54. Fattahi Bafghi A, Vahidi AR, Anvari MH, Barzegar K, Ghafourzadeh M. The in vivo antileishmanial activity of alcoholic extract from Nigella sativa seeds. Afr J Microbiol Res. 2011; 5(12): 1504-1510. Hadighi R, Mohebali M, Boucher P, Hajjaran H, Khamesipour A, Ouellette M. Unresponsive­ness to glucantime treatment in Ira­nian cutaneous leishmaniasis due to drug-re­sistant Leishmania tropica parasites. PLoS Med. 2006; Article ID 16605301. Peters W. The treatment of kala-azar, new approaches to an old problem. Indian J Med Res. 1981; Article ID 6897932. Sukumaran B, Madhubala R. Leishmaniasis: current status of vaccine development. Curr Mol Med. 2004; 4(6): 667-679. Rodrigues E, Barnes J. Pharmacovigilance of herbal medicines. Drug safety. 2013; 36(1): 1-12. Moghtader M. In vitro antifungal effects of the essential oil of Mentha piperita L. and its comparison with synthetic menthol on Aspergillus niger. Afr J Plant Sci. 2013; 7(11): 521-527. Alviano D, Alviano C. Plant extracts: search for new alternatives to treat microbial diseases. Curr Pharm Biotechnol. 2009; 10(1): 106-121. Rocha L, Almeida J, Macedo R, Barbosa-Filho J. A review of natural products with antileishmanial activity. Phytomed. 2005; 12(6): 514-535. El-On J, Ozer L, Gopas J, Sneir R, Enav H, Luft N, Davidov G. Antileishmanial activity in Israeli plants. Annals Trop Med Parasitol. 2009; 103(4): 297-306. Tempone AG, Sartorelli P, Teixeira D, Prado FO, Calixto I, Lorenzi H, Melhem MSC. Brazilian flora extracts as source of novel antileishmanial and antifungal compounds. Mem Inst Oswaldo Cruz. 2008; 103(5): 443-449. Sharif M, Ziaei H, Azadbakht M, Daryani A, Ebadattalab A, Rostami M. Effect of methanolic extracts of Artemisia aucheri and Camellia sinensis on Leishmania major (in vitro). Turk J Med Sci. 2007; 36(6): 365-369. Valadares DG, Duarte MC, Ramírez L, Fumagalli MAC, Lage PS, Martins VT, Costa LE, Ribeiro TG, Régis WCB, Soto M, Fernandes AP, Tavares CAP, Coelho EAF. Therapeutic efficacy induced by the oral administration of Agaricus blazei Murill against Leishmania amazonensis. Parasitol Res. 2012; 111(4): 1807-1816. Valadares DG, Duarte MC, Ramírez L, Fumagalli MAC, Martins VT, Costa LE, Lage PS, Ribeiro TG, Castilho RO, Fernandes AP, Régis WCB, Soto M, Tavares CAP, Coelho EAF. Prophylactic or therapeutic administration of Agaricus blazei Murill is effective in treatment of murine visceral leishmaniasis. Exp Parasitol. 2012; 132(2): 228-236. Mallick S, Dutta A, Dey S, Ghosh J, Mukherjee D, Sultana SS, Mandal S, Paloi S, Khatuaomanjana S, Acharya K, Pal C. Selective inhibition of Leishmania donovani by active extracts of wild mushrooms used by the tribal population of India: an in vitro exploration for new leads against parasitic protozoans. Exp Parasitol. 2014; Article ID 24440295. Kong WS. Descriptions of commercially important Pleurotus species. In: Mushroom world. Oyster mushroom cultivation. Part II. Oyster mushrooms. Seoul: Heineart Incorporation, 2004. Jayakumar T, Thomas P, Sheu JR, Geraldine P. In vitro and in vivo antioxidant effects of the oyster mushroom Pleurotus ostreatus. Food Res Int. 2011; 44(4): 851-861. Vamanu E, Ene M, Vamanu A, Smarandache D, Sabru I, Popa O, Babeanu N, Nita S, Veaceslav B. Antioxidant and antibacterial properties of the extracts from Pleurotus ostreatus EVFB1 and EVFB4. Romanian Biotech Lett. 2011; 16(1): 40-46. Jayakumar T, Thomas PA, Geraldine P. Protective effect of an extract of the oyster mushroom, Pleurotus ostreatus, on antioxidants of major organs of aged rats. Exp Gerontol. 2007; 42(3): 183-191. Naguib YM, Azmy RM, Samaka RM, Salem MF. Pleurotus ostreatus opposes mitochondrial dysfunction and oxidative stress in acetaminophen-induced hepato-renal injury. BMC Complement Altern Med. 2014; Article ID 10.1186/1472-6882-14-494. Iwalokun B, Usen U, Otunba A, Olukoya D. Comparative phytochemical evaluation, antimicrobial and antioxidant properties of Pleurotus ostreatus. Afr J Biotech. 2007; 6(15): 1732-1739. Fairlamb AH, Cerami A. Metabolism and functions of trypanothione in the Kinetoplastida. Annu Rev Microbiol. 1992; Article ID 10.1146. Luiz HR, Machado KMG, Rabello ALT, Souza-Fagundes EM, Correa-Oliveira R, Carlos AR, Carlos LZ. Cytotoxic, immunosuppressive, trypanocidal and antileishmanial activities of Basidiomycota fungi present in Atlantic Rainforest in Brazil. Antonie van Leeuwenhoek J Microbiol. 2009; 95(3): 227-237. Khanjani Jafroodi S, Farazmand A, Amin M, Doroodgar A, Shirzadi M, Razavi M. Methanolic extract’s activity of Artemisia absinthium, Vitex agnus-castus and Phytolaca americana against Leishmania major in vitro and in vivo. Int Arch Health Sci. 2015; 2(2): 69-74. Jayakumar T, Thomas PA, Geraldine P. In vitro antioxidant activities of an ethanolic extract of the oyster mushroom, Pleurotus ostreatus. Innov Food Sci Emerg Technol.2009; 10(2): 228-234. Sadeghi S, Seyed N, Etemadzadeh MH, Abediankenari S, Rafati S, Taheri T. In vitro infectivity assessment by drug susceptibility comparison of recombinant Leishmania major expressing enhanced green fluorescent protein or egfp-luciferase fused genes with wild-type parasite. Korean J Parasitol. 2015; 53(4): 385-394. Dalimi A, Ghaffarifar F, Sadraei J. Cytotoxic effects of 5-fluorouracil on Leishmania major promastigotes and induction of apoptosis in the parasite. Scientific J Ilam Uni Med Sci. 2014; 21(7): 34-42. Ebrahimi Sadr P, Ghaffarifar F, Hassan ZM, Beheshti N. The effect of artemether-induced apoptosis in promastigotes of Leishmania major (MRHO/IR/75/ER) under in vitro conditions. Modares J Med Sci. 2012; 15(2): 1-10. Abdel-Aziz SM, Hamid HA, Fadel M. Edible mushrooms: a green biotechnology and great nutritional value for improving human health. Int J Sci Engineer. 2015; 1(8): 1-17. Ike K, Kameyama N, Ito A, Imai S. Induction of a T-Helper 1 (Th1) immune response in mice by an extract from the Pleurotus eryngii (Eringi) mushroom. J Med Food. 2012; 15(12): 1124-1128. Ligonio AR, Monteon AL, Trigos Á. Trypanocidal activity of ergosterol peroxide from Pleurotus ostreatus. Phytother Res. 2011; Article ID 10.1002/ptr.3653. Paris C, Philippe M, Loiseau, Bories C, Bre J. Miltefosine induces apoptosis-like death in Leishmania donovani promastigotes. Antimicrob agents Chemotrapy. 2004; 10(3): 852-859. Thornberry NA, Lazebnik Y. Caspases: enemies within. Science. 1998; 281(5381): 1312-1316. Johnson DE. Noncaspase proteases in apoptosis. Leukemia. 2000; 14(9): 1695-1703.